SUNNY&COZY 3 BEDR, 2 BATHR, 2 TERR, SEA VIEWS, PERFECT LOCATION, WHAT ELSE...??? We welcome you to our comfortable and sunny apartment which offers everything that your family could dream for a perfect holiday at the blue Mediterranean. This apartment has an ample lounge with 2 sofas & TV/WIFI area, sunny dining area with family table and 6 chairs to enjoy meals with sea views; glazed terrace for relaxing & sunbathing winter or summer while looking to the sea; full equiped kitchen with all home appliances as vitro-oven, super fridge, dishwasher and washing machine into gallery-laundry; 3 double bedrooms - magnific master bedroom with direct access to terrace with sea views and private bathroom- and 2 other bedrooms with twin beds -one of them with access to private terrace with views to Alicante´s Castle green area- and 2 bathrooms -one in suite in the master bedroom with shower- and other with bathtube and shower. The property is inside a wonderful and complete private residential "Santa Bárbara" which includes : full day concierge service, 2 swimming pools-for kids & adults-, beautiful green garden with umbrellas around the pools for sunbathing, safe playground area for children, multisport court and private garages -apartment has its own- . 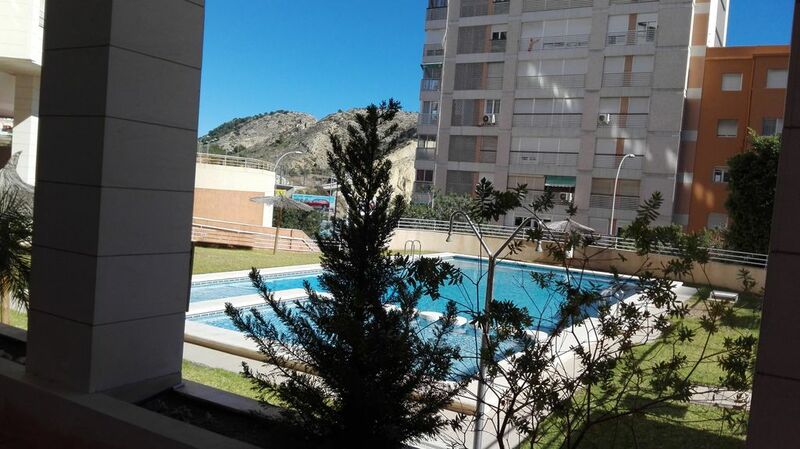 Remark that this is the only private residential of this kind located in Alicante beach/center area, just 5 minutes walk to magnific city beach "El Postiguet", 10 minutes walk to cute old town and 100 meters to biggest shoping centre in the city "Plazamar2"-130 shops-. Moreover a free pedestrian access to the most important monument in the city, "Santa Bárbara Castle", is just 60 meters of the building. The most important museum "Marq" - Archaelogical Museum- considered one of the best in Europe, is 100 meters from the apartment. There is a good hospital "Virgen del Socorro" 60 meters from the building and the "Maya Hotel " just on the back where you can enjoy its excellent restaurant, relaxing chill out corner and different leisure events. The building is located very near excellent options of public transport : 80 meters to C6 bus stop which drives to/from Alicante airport every 20 min -price 3,85€- , Tram station "Marq Castillo" -60 meters- which Line 1 drives to Benidorm every hour - price 6€-, lines 2 and 3 to beautiful "San Juan Beach" and cute "El Campello" fishermen village where visitors are welcome to participate in the daily fish auction at the fish market . If you love sport Alicante leisure sport - located 10 minutes walk from apartment- offers you a wide range of water activities for different ages, levels & prices. But if you are a golf lover, then you can easily arrive to any of the 2 golf courses located less than 1/2 hour from apartment : " San Juan" -near San Juan Beach where you can go even by tram or bus- or "Bonalba" - near El Campello. There is also option for wonderful mountain hikes at the inlands of Alicante province which offers you not only sun & beaches but also extraordinary natural parks where enjoying wildlife and practise birdwatching, botanical walks and others. And excursions to cute villages as Aigües, Guadalest, Novelda, Villena where you can enjoy old castles. Finally, gastronomy & wines are of the highlights of this land. The variety of local dishes made with excellent fish & rice -the famous "paella" in more than 50 different recipes- delicious fresh fruits& vegetables and some international awarded wines which you can taste and get for very affordable prices directly at the wineries after an interesting visit where you´ll learn many things about wine. Visits in English and other languages are available at every winery under previous request. Average price for a visit includind wine tasting of several wines & snacks is around 10-15€/person. I´ll be glad to provide you about all information you could need during your stay. Select this apartment because it has a unique location, near to beach, shopping and old town, and the apartment has everything you need for a loving holiday. Near to everything and a view to the sea. POSTIGUET BEACH is considered as one of the best in Spain, winner of a "blue flag" of the E.U. due to the quality and cleanliness of its water& sand, security, public facilties and environment. SANTA BARBARA CASTLE , most emblematic monument of the city, is located on top of "MONTE BENACANTIL", best viewpoint over the city. There´s an access (bus/pedestrian) just 150 meters from apartment. Central A/A system in every room cold/heat. One private spot (nbr 63) available at the UNDERGROUND COMMIUNITY PARKING. Surface is 23,50 m2 SUITABLE FOR BIG CARS. One private spot (nbr 63) available in the communal subterranean parking of the residential. Surface is 23,50 m2 . 1 shower towel + washbasin towel PER GUEST FOR THE ENTIRE STAY. Beach towels are not included but can be rented for € 6 / unit, if you prefer not carrying your own into cabin luggage. elevator from hallway to every floor and also available directly from garage. some basics such as salt&pepper, vinegar, tea& sugar are usually available in small amounts (just for short stays, long stay guests should get their owns stuff). Fully equipped kitchen with everything needed and even though a WATER FILTER (by osmosis system) which purify water´s calcium. There are 2 TV´s : One 55 " TV in the living area and one smaller 32" in the master bedroom. Nice green garden around the pool where guests can relax & sunbathing while watching their children in the pool or the play-ground area. We can provide info for kayak rentals and tours. We can provide info for boat rentals and tours. 2 glazed terraces, one to the front with SEAVIEWS and very sunny in the mornings. Another on the back, very sunny in the afternoon and overlooking a green area of the Castle. Both are smokers area. Guests have FREE ACCESS to communal multisport court (tennis, basket, mini football...) inside the residential. Alicante Golf http://www.alicantegolf.com/esp/index.php Bonalba http://golf.golfbonalba.com/ La Finca Golf Las Colinas Golf. ACCESS FOR REDUCED MOBILITY PERSONS/WHEELCHAIRS is at the BACK ENTRY to the private residential where apartment is located. Please tell to taxi driver to go to HOTEL MAYA, which is just behind the building. From hotel´s entrance, go down the street approx. 20 meters till arriving to a big white metalic fence where it´s written "URBANIZACION SANTA BARBARA", then press intercom button marked "ESC 2, 5C" for entering in to the back parking area, go ahead 5 meters to building and once again press another intercom located out of the hallway door (press again ESC2, 5C). Once inside the hallway, go to your LEFT and take lift to 5th FLOOR, door C.
You are more than welcome to ask about possible excursions whether is wishes for a wine tour, flamingo evening, visiting caves or bathing under a waterfall. Just name your wishes, and we will try to help you. 1. Hot water is suitable. 2. Water pressure is fantastic. 4. Views are good to the Mediterranean and to the neighborhood. Not right on the water but water views. 5. Plenty of good restaurants in the neighborhood as well as within only 1 mile walking. 6. Alicante is a wonderful city with outstanding and kind people. 7. Neighborhood small shops are friendly. 8. Small shop and large markets very close to unit which makes it easy to get what one might need. 9. Unit is fully equipped with what an average couple might need. This even includes beach towels and the rolling cart for shopping. We bought our own beach umbrellas. 10. Air conditioner works well. (Not for HomeAway but since we are from Florida, we are use to heat and do not require colder temperatures.). 11. Washing machine is in the unit. Very much a plus being near the beach. 12. Unit very close to transportation for easy visits of other beaches such as San Juan and Benidorm. 13. Furniture in the unit is suitable especially for us as a couple. 14. Unit building has a well kept swimming pool. 15. Unit is very close to the Postiget beach. 16. Organic store with vegetables and fruits within feet of the unit and the nearby large supermarket has an organic and gluten free section. 17. Wi-Fi is included and works very well. 18. The beds were comfortable. 19. Unit has suitable storage. 21. The unit is equipped with a dishwasher. We did not use it. There was just two of us and we did not accumulate enough dishes fast enough to justify its use. 22. Most importantly, the contact Megan (Margarita) was fantastic before and during our stay. She pursued ensuring all was in order and any needed repairs quickly resolved. Cons: We rented for August and September. The blind in the Master bedroom was broken and because August is vacation time, it took until September 18th to repair so for quite a while we did not have the wonderful view or natural light in the bedroom. In the beginning of September there was a very lot of construction around the pool area and the back parking area. Pool was not usable but we did not mind because we preferred the beautiful beach and because everything was so close did not have a car. Therefore neither thing was a major bother other than the mess areas that construction causes. We stayed at this property for nine days, three adults and one kid(15). The apartment is very nice and holds all the facilities you want as a family on vacation in Alicante. It is very close to the beach, walking distance, and very close to the city centre, restaurants and site seeing/historic sites. We can only recommend families and couples to stay at this apartment if you want a nice, comfortable and practical place to stay and within a good price range. Thanks a lot for your nice comments !!! You & your fantastic family were also first class guest and will always be very welcome at the apartment. Spent 4 nights at this appartment, loved every minute. Well done Megan, you did a great job. Thanks a lot for you nice comment. We´ll be glad to have you here again !!! Large 3 bedroom, 2 bathroom apartment with a good-sized swimming pool next to Hotel Maya Alicante. Convenient bus stop outside (02 bus) or tram station (MARQ - Castillo) 220 metres from the bus stop taking you to town centre (about 1.2 to 1.5km), or tram to coastal resorts including Benidorm (about 6 euros on tram). Single ticket takes you on one trip to anywhere on the route through Alicante and up to El Campello on the tram. Multi-journey tickets can be bought from TAM shop at top of Rambla Mendez Nunes (initial cost 2 Euros with top-ups of 10, 20 or 30 at 8.70 euros per 10 journeys available). Single ticket prices around 1.45 Euros if you just want to pay on the bus or tram. Multi-journey tickets can be used for more than one person by swiping for each person. The ticket machine shows the number remaining on the ticket. Northern end of Postiguet Beach is about 500m from front gates but Google does not show directions properly for pedestrians. Google takes you to south end of Postiguet beach and along promenade which more than doubles the apparent distance. Santa Barbara Castle is definitely worth a visit with magnificent views of the city and the beach. It is free to visit if you walk up there or 2.70 Euros via lift halfway along Postiguet beach (free for over-65s) and free to descend via lift. Large shopping centre Plaza Mar 2 with large well-priced hypermarket Al Campo is nearby. Most of smaller shops and hypermarket are closed on Sundays but the food court including McDonalds and Taco Bell are open on Sundays. Quickest route is out the back gate of the apartments and across the road, then across Avenida de Denia and up the eastern road to the main car park and through that to the lower floor escalator. Owner of the apartment kindly provided a shopping trolley and cool bag. Loved our stay here and would go again if back in Alicante city. Thanks a lot for your nice and very detailed comments. You´ll always be welcome !!! Tæt på det hele: lufthavn (bus), strand (10 min. ), indkøbsmuligheder (5 min. ), spisesteder (10 min.). Lille, men ok pool. En del regler, som SKAL accepteres. Thanks a lot for your practical comments. The reason to set some "Home Rules" was that unfortunately, there were some problems with one of the previous clients, who bothered much to the neighbors, so we just wanted to prevent that situation happens again...But of course, absolutely no complaint about you and your nice family and you´ll always be welcome..
Several golf clubs in the area. Several small cafes within 50 meters. Butchers, bakers and delicatessens within 100 meters. "Plazamar2" Shopping Centre within 150 meters.